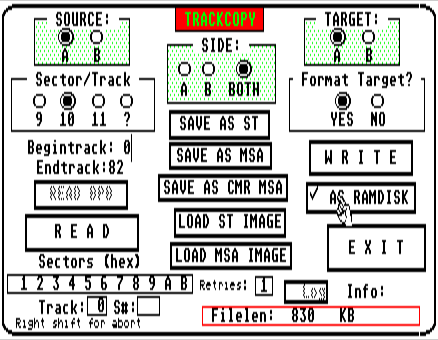 Image in this case is exact copy of floppy disk in file. Most common image formats for Atari ST are ST and MSA (file extensions). Such images were developed for usage with diverse emulators, mostly on PC. There is STX (Pasti) image format too, but it is usable only with emulators. There are thousands of Atari ST floppy images downloadable on WEB, and many people want to run (mostly games) from them on their Atari machines. This small program will allow above for many (we will see how many %-ally by time) Atari ST games - to run them from floppy image files on real Ataris, without need to write images on floppies. Of course, program is interesting only for hard disk owners. Principle of work is to copy image file in high RAM and restart TOS, then mounting RAMdisk as drive A, executing AUTO folder from image file etc... Hard disk driver is discarded, we have free low RAM, what is usually good for games, made for 'floppy only' Atari machines. GEMDos file access and XBIOS A floppy read is mapped to RAMdisk. Access to logical drive B (even if no second floppy) is mapped to physical drive A. It works by most of Automation menu disks, and many others - where games are filed and compacted. But works not by games/menu disks where programs use direct floppy controller access. Such games can not be run without writing on floppies, except we do some changes in them, what requires expert and some time. If see floppy LED activity by game start (and by level load), and game freezes, works not, it is very likely case of direct floppy cntroller access (called DMA loader often). Then may try other menudisk with same game, or write image to floppy. Of course then may happen that game still not works - reason is usually incompability with TOS version, but may be corrupted image too. You need min. 2MB RAM for this to work. With 1MB can run single-sided floppy images (~400KB long ones). In case that you have game in some DIR on Atari hard disk, but it runs not, you may try to write files in image file and run it with this program - point is in better RAM usage (for games) - may put executable in AUTO folder in image and similar. There are some utils for image handling. All it can be done on PC, with Steem for instance, or with FloImg. Version for better compatibility with TOS 2.06: (April 2009): While keeping simple usage and fast work some improvements added. This is intended mostly for TOS 2.06 and (M)STE machines - it may set TOS 1.04 to run on STE or Mega STE, what will ensure running of more games. For instance Skychase and Iron Lord will work with it on Mega STE. So, if in DIR where floppy image is there is a file T14UIDUB.FIC (included), then it will install TOS 1.04 in high RAM. Otherwise it will work only with TOS 2.06. Regardless from which TOS will work user may set 2 things by running PRG (drag & drop image file into) : when holding Left Shift down by program start it will execute bootsector of floppy (image). It is needed by few games/menu disks. When holding Right Shift down by program start it will set TOS 1.04 (if installs) and image resident - so after pressing reset button machine will remain with TOS 1.04 and image file installed - this is welcome for menu disks with more games on. So, no need to run PRG again. You need to hold down proper shift key few seconds while starting PRG for correct detection. In archive is another gaming help program: T14HIGH.PRG - which installs TOS 1.04 on M(STE) machines with hard disks - for games not liking TOS 2.06. Of course TOS 1.04 requires additional RAM: by Image Runner it occupies + 192KB. By T14HIGH occupies 256KB, but there is space for hard disk driver too in that, so low RAM will remain exactly same as by working without hard disk (in case of compatible driver). Easy to use version Versions for TOS 2.06, TOS 1.62 & 1.06, TOS 1.04 and TOS 1.02. Added support for combined floppies (SS with some data on side B), as AU_94 and AU_133. Or associate extension(s) to PRG. Technical background: Usual way of loading data, programs is via filesystem functions of TOS. It means loading files, file fragments by named files, from (named) directories. About 40-50% of Atari games (rough estimation) works on that way. Other way is loading data, code by position on disk. Inside it we have again 2 ways (talking about loading from floppies): load using XBIOS call (#8) or by direct HW (FDC) access. So far, I saw only 2 games using XBIOS floppy read: Sundog & Black Cauldron. Direct FDC access: it is necessary in cases when usage of regular TOS functions (XBIOS, GEMDOS) is not possible, and it occurs when game uses very low RAM area, what is normally reserved for TOS workspace. The reasons for such RAM usage are usually: need for all RAM in machine (of 512KB) for game, using some special, non-standard disk stracks with purpose of copy protection and/or to put more data on them. Most advanced and quality games usually use mentioned direct FDC access and all RAM in machine: from bottom up to 512K (or to 1M if game needs so much). In case of using filesystem some 50KB (or more by higher TOS versions) is reserved for TOS, so there is less for game self. Image Runner works so, that replaces regular filesystem calls to floppy A with access to newly created RAMdisk containing image. So, when game gives command to read something from floppy A, it will be redirected to reading from RAM. When it works: in all cases where game uses regular TOS file access or XBIOS floppy access, and no copy protection and/or any direct FDC calls. So, games like Flight Simulator 2 will work fine. Then, cracked versions of games using regular filesytem and some copy protection will work too, as crack removed copy protection (what usually uses direct FDC). Example: Millennium 2.2 . Even games using very low RAM may work, but only in cases when everything is loaded at start, and no further floppy access (called singleparted often). When works not: games using direct FDC access, as mentioned. Examples: Armour-Geddon. Then, even by cracks where we have regular files on floppies it will not work if crack self uses direct FDC instead TOS functions. Explanation: intention of crackers was allowing easier disk copying, and not running from hard disk. Note: decompression of Backlash is shortened - irrelevant here. Sundog - rare one which uses XBIOS - works on 1MB machines. Similar: Running Dungeon Master from special RamDisk - get files on http://dmweb.free.fr/?q=node/881 . As may see, most of Automation menu disks is usable well. This is because practically all games are filed, and no direct floppy controller access. Of course reasons for not working can be several: tos version, hardware version and even RAM amount in machine. On TOS 2.06 will work less title than on 1.4, for instance. Many game save positions on floppies - it works regardless from how game is started/installed. So, never keep floppy with valuable datas on it in drive while playing. Games can write anywhere on floppy, format it etc. And it is not good to hold floppy in drive in any case - floppy rotation will just erode magnetic surface. Use just some work floppy for faster start of machine. P. Putnik , April-June 2007. March, Okt. 2008, April 2009, April 2010.